In November 2006 we installed Momo's new main, replacing one that was as old as the boat -- that is to say, over a quarter of a century. Three years (and 14,000 miles) later, that sail was trash. And though I defended it to Michelle -- whose mind is much less clouded -- at various points along the way, the fact is that the sail was never very good, tearing far too often and at the slightest provocation. The first sign that the sail was of inferior quality was when a reefing line, hanging loosely from the reefing cringle, wore through the sail just above the boom. Which was surprising, for we don't usually consider the mere presence of reefing lines to be excessively stressful. Next, the sail began to give us problems when we reefed -- each time we reduced sail, we stood a good chance that the reefing line would cut through the sail when we drew it tight. Then the sail started to develop little holes when we straightened out the cloth. Finally, one day just before the sail's third birthday, while reefing in about 20 kts of wind, the sailcloth exploded near the reef point, producing a two-meter tear; and in the seconds following, as we lowered the flogging sail, it developed a 1.5 meter tear near the head. We cursed the decrepit sail and tried once more to repair it with our sewing machine, even though we knew there was little point. 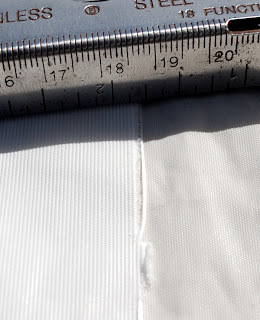 The sail had become resistant to machine repairs -- the needle did more damage than good. Indeed, by now our sail was a quilt-work of awkward hand-stitched repairs and colorful glued-on vinyl patches. Ultimately, we carried out perfunctory repairs using glue and PVC cloth, but the sail was beyond salvation. tear just above a reef point. Anchored in Fiji on the cusp of cyclone season, we knew that the sail would never survive the notorious 1000-mile passage to the safety of New Zealand. Fortunately, we still had our vintage main, crammed ignominiously into an aft locker. Welcoming it back into our lives like an old friend, we hauled it out, recommissioned it, and marveled at the quality of the ancient cloth. Life again was good. It is with some reluctance that I say that the unfortunate mainsail was made by a sailmaker in Hong Kong, in part because I don't wish to evoke any knee-jerk reactions to "cheap sails made in China." But also because the workmanship on the sail was really quite good. Moreover, in the end, this sailmaker treated us well. The real culprit was the sailcloth itself -- which was made in America. When we originally ordered our sail, we focused on the quality of the stitching, the weight of the sailcloth, and the strength of the slides. In our experience, these were things that mattered most; after all, deteriorated stitching and broken sail-slides had accounted for most of our repairs in the past. They were also things that could be easily judged. We took the quality of the sailcloth for granted, but that was a mistake. The quality of polyester (i.e. Dacron) sailcloth is more of an issue today than it was, say, thirty years ago. According to Dan Neri in Sail Care and Repair (Beowulf: 2002), the quality of woven polyester "is just not as good as it used to be," mostly because of a lower demand, now that racers use laminated fabric for their sails. Also, sailcloth manufacturers make different grades of sailcloth -- some of which are definitely better than others. The difference in price between the grades of cloth is significant. Our sail was made with 9.3 oz high aspect cloth manufactured by an American company; it is one of the most popular cloths used for making cruising sails and found in sail-lofts everywhere. It is not the manufacturer’s worst cloth, but it is also not their best. Their best sailcloth, made of tightly woven premium polyester costs the sailmaker about 50% more than the stuff that was used for our sail. So unless you make a point of asking for it, you're probably not going to get it. 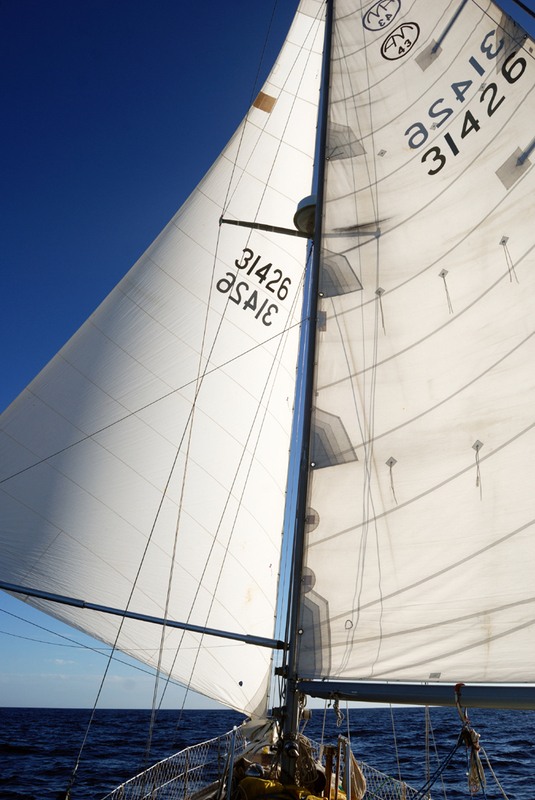 With cheaper sailcloth, manufacturers rely on a relatively high resin content to maintain directional stability; that is to say, to reduce stretch. By increasing the degree of resin impregnation, they can still get the results they want while using inferior fabrics. The problem, however, is that the resin breaks down as the sail is used, and the sail quickly deteriorates. In the case of our sail, the cloth still had the stiffness of a moderately new sail, but it tore easily. Our vintage sail, on the other hand, is much more supple -- and it also has a much tighter weave. The problem with our faulty sail was also aggravated by the fact that it was made from 'high aspect' cloth. High aspect cloth is woven so that the yarn in the 'fill' direction is especially strong. With the 'fill' oriented vertically in the sail, this type of weave helps the sail retain its shape when used on a high aspect sail. The downside is that the horizontal 'warp' is comparatively weak. Thus, while the 'fill' on our sail was still quite strong, the 'warp' threads tore like paper. 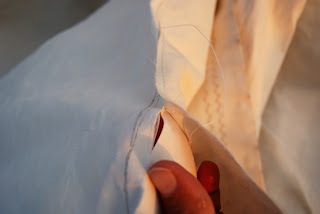 When we reported our problems to our sailmaker, they in turn contacted the sailcloth manufacturer, who suggested that the failure was due to UV-degradation. I don't doubt them, given that about 65% (but no more) of our sailing occurs during day-light hours. But when we're not sailing, the sail is protected by a thick sailcover. And our head sails -- which are as old as the boat, take more of beating, and with which we have sailed more than twice the mileage endured by our mainsail -- are in better condition than the ‘new’ main. Sure, I've spent plenty of quality time stitching them back into shape and healing minor wounds, but the cloth is still all right. Some have suggested that the cloth came from a faulty lot. Perhaps, but we're not convinced. We've heard too many stories about short-lived sails. I recall the details about two of them: one was a sail made in New Zealand using European cloth; the other was a sail made in British Columbia (the friend who bought this sail let me tear samples of it myself). Both woeful tales were told by people who have spent more time at sea than almost anyone we know. Even if it did come from a faulty lot, the fact that it passed quality control is probably not a mistake but good business practice. Most people don't use their sails the way we do. Fourteen-thousand miles make for a lot of trips between LA and the Channel Islands, around the Chesapeake Bay or from Newport to Block Island. Most sailors would, indeed, have been quite happy with our main. So, were the deficiencies of our main the result of a bad batch of cloth? Or is it just that, for the most part, this cloth is good enough for most types of sailing, but not the kind of stuff you’d want to hang from your spars for numerous ocean passages? I should also note that even though the cloth was a disappointment (to say the least), I wouldn't necessarily say that the sail was a bad deal. Quotes we received from a top-notch American outfit to make a similar sail were five times as high. I have no doubt that they would have used better cloth, but not that much better. I know, too, that some people swear by their expensive sails. But once you’re spending that kind of money, you also have an emotional commitment to what you’ve bought (indeed, I had an emotional commitment to our inexpensive Chinese sail until it really let us down). If you really want to know what people think about their designer polyester sails, you have to ply them with drink. Our experience with our offshore sailmaker was, in the end, quite good. Initially, we had difficulty getting anyone to respond to our emails. In fact, after the sail had been delivered, the agent in Vancouver, B.C. treated us as if we'd sailed off the edge of the earth. But eventually an agent in Hong Kong got back to us and offered us a new sail at a 40% discount. Their original proposal was to make us a sail with heavier cloth or with thicker warp threads. But we were reluctant to have a sail made from the same type of cloth as the old one. So we asked for a premium cloth, and they complied. They still had all of our measurements and digital photographs from when we placed the order three years back. They also accommodated a few minor changes and let us reuse our metal slides for a moderate discount. Now, as we contemplate purchasing new head sails, where does this experience leave us? Clearly, our negotiations with sailmakers will now include a discussion of sailcloth. But not all sailmakers want to have this discussion. We would gladly buy sails again from that same sailmaker in Hong Kong, for example, but only if we could specify the cloth -- which isn't likely. 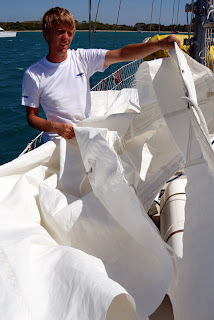 Despite the fact that they used the cloth we requested to replace our mainsail, when we asked whether they could make us head sails out of that same cloth, they told us they don't buy the cloth and won't be able to offer it for our head sails. Out of curiosity, we also checked with a second outfit in Hong Kong. But when we asked whether they could make us something from a better polyester cloth, they steered us towards a laminate, which is clearly not what we were looking for. Another company advises on its website "that you leave the type of fabric and weight of cloth to our sail designers," to which I can only reply:you've got to be kidding! But when I contacted their nearest loft (which for us was in Australia), they told us that they stock a variety of cloths, including premium sailcloths. This sounds more like the beginning of a conversation we'd like to have. One thing for us is certain: the next time we buy new sails, the quality of the sailcloth will be a primary concern. We'll get samples of the cloth beforehand and compare the finished product with the samples they send. One final note: the manufacturer who made the cloth for our sail has recently changed its product line -- they now have a few more products to choose from. Whether that means that the quality of their lower-end cloth has improved is something we can't judge. But a little skepticism never hurt anyone. For those interested, the mainsail in question was produced by Lee Sails in Hong Kong. The cloth was "High Modulus/ High Aspect Cloth" manufactured by Challenge Sailcloth. We were happy with Lee Sails quality of workmanship, and perhaps if enough people ask they will be willing to use higher quality sailcloth. If so, let us know. Although there are hundreds of types of sailcloth, they can generally be divided into two categories: woven polyester fabrics and laminated fabrics. The development of woven polyester fabrics in the 1950s was truly revolutionary, for polyester sailcloth was in every way superior to woven cotton and immediately rendered the latter obsolete. In contrast, the development of laminated fabrics since the 1970s has significantly improved sail performance, but in other respects woven polyester has retained certain advantages. One major advantage is price: a quality polyester sail still costs significantly less than a sail made with laminates. Not only is laminated fabric more expensive, but making the sail is also more labor-intensive. But there are other differences as well which explain why, despite the fact that laminated sails have taken over the racing scene, the overwhelming majority of cruisers still rely on sails made of woven polyester – this notwithstanding the efforts of sailcloth manufacturers to market their laminated cloth to cruisers. Polyester fabrics are created on a loom much like any other typical fabric, with “fill” threads woven in and out of “warp” threads. Although the fabric is stiffened with resin, the weaving process itself allows for a certain amount of stretch and that stretch increases as the resin breaks down. In contrast, laminated fabrics are constructed by gluing together a number of layers, some of which are woven and others are not. A typical performance cruising laminate might be comprised of five different layers: a woven scrim at the center sandwiched between layers of extruded plastic (Mylar, for example) which in turn are protected on the outside by layers of tightly woven taffeta. The resulting sailcloth is strong, light, and extremely stable. Its virtues especially come into play when sailing to weather. 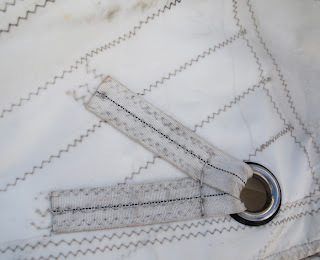 Whereas a woven polyester sail will inevitably stretch in these circumstances, a laminate sail will hold its shape, allowing the boat to point higher, heel less and perform better. Moreover, while the stretch in a polyester sail increases over time, a laminated sail will retain its shape throughout its life. But the increased performance involves certain trade-offs. Laminated sails are stiffer and more difficult to handle, which is more of an issue for a short-handed crew than for a team of racers. They are also more susceptible to damage from flogging or folding and need to be treated much more carefully. And while one may promise to be diligent, such diligence is not always possible. Moreover, given a greater susceptibility to UV and chafe, the overall life expectancy of a laminated sail is shorter than one made of quality polyester. This may not matter to hard-core racers who are willing to change their sails every season to keep their performance sharp, but most cruisers have different priorities. That being said, sailcloth manufacturers clearly want to make their laminates more attractive to cruising sailors, developing fabrics that are more durable and last longer. Their success will depend on whether the long-term experiences of the intrepid cruisers who choose laminated sails will support the claims of the sailcloth manufacturers. Very well written and balanced. I learned a lot from this post. I had never even looked into the difference of sail cloth and laminate sails. Exactly -- very well written and even-handed. It would be easy to bang your shoe on the table and complain about schlock goods. But this is a nice job thinking things through. You learned, and so did we. hey guys, for what it's worth, jamie (who spent the better part of a decade as a sail designer) believes you are going way to easy on the sailmaker. they should never have let you get the wrong cloth in the first place- also, the pic showing "good workmanship" on the sail? not so good, he thinks. lemme know if you want to explore in more detail. Certainly, Behan, I’d like to hear more about what y’all have to say. I might very well have been too easy on the sailmaker. I can’t personally tell whether the type of cloth was fundamentally wrong or whether it was from a bad batch, so to speak. I had a lengthy correspondence with Lee sails about the sail and the sailcloth, and at the end of the day we don’t trust them enough to make sure that the cloth they use is any good to buy sails from them again. So we’re spending almost twice as much to have sails made in New Zealand (and even that’s reasonable compared to what we might possibly spend). As far as ‘workmanship’ is concerned, I would be very interested in hearing what Jamie has to say. But clearly, in this case, workmanship wasn’t the problem. We had a few gripes, but nothing failed and we could have lived with the workmanship; but we couldn’t live with cloth. And let’s face it: the sail was cheap. How much justification do I have, really, to complain about the workmanship? The question regarding 'quality workmanship' intrigues me more generally, because somewhere there’s a line between ‘workmanship’ that’s functional and gets the job done, and ‘workmanship’ as an aesthetic value – the kind that one might find in, say, a Gucci handbag (I’ve seen pictures, but never fondled one). We can’t afford Gucci handbags & we also can’t afford designer sails. And from my perspective, it’s still better to be cruising with a mediocre set of sails than working all year to save up for something especially exquisite. Will let Jamie know & get back atcha. happy holidays... love that people here in Oz (maybe NZ too?) call it the Silly Season! Nice opinion all about sailmaker, mainsail, sail manufactures and new sails. Thanks for sharing.